Downtown Oakland was abuzz Saturday afternoon as patrons flocked to the Paramount Theatre for Oakland Ballet’s program honoring the Day of the Dead. Entire families, including the youngest members, filled the aisles; the crowd was peppered with stunning Calaveras faces. Excitement and anticipation for the third year of OBC’s Luna Mexicana – Día De Los Muertos was palpable. What transpired over the next two hours certainly met those expectations – the dance and movement were truly delightful. I wish I could say the same about the recorded music. Not that it was recorded as opposed to live, but that the mix seemed off the entire show. The treble highs were piercing, loud and clippy, making the music uncomfortable to listen to. And that’s coming from someone who isn’t particularly sensitive to sound. It pulled focus from what was happening on stage, which was a bit of a shame. 2018’s program brought an eclectic mix of four pieces, including a world premiere collaboration, and of course the return of 2016’s Luna Mexicana, the title work choreographed by Oakland Ballet’s Artistic Director Graham Lustig. Two guest companies were also featured on the bill, and it was they who kicked off the afternoon with a pair of extraordinary percussive performances. Using ritual, text and movement, Aztec dance ensemble Nahui Ehekatl and Co. provided the perfect introduction into the space – like a call or invitation to each audience member to quiet their minds and be in the moment. Goblets of smoke were offered up to the heavens; drums, reed flute and ankle bells provided the score; vibrant traditional Aztec feathered headdresses filled the stage. And because this was the one dance that didn’t have recorded music, there was nothing to distract from the grounded, pulsing physicality. The sound mix notwithstanding, Ballet Folklórico México Danza was absolutely ebullient in Nuevo Leon. I don’t know whether the dance had any story or narrative component, but what I absolutely know is that the choreography by Martín Romero and the dancing from twenty-two company members was out of this world. Joyous in mood and tone; technically flawless in footwork, turns and extensions; dynamically intricate in stage patterning and partnering. And unlike some other percussive cultural dance traditions, the upper body was such a big part of the choreography, which made for a richer, deeper movement expression. Lustig’s Luna Mexicana transports the viewer to a realm where its protagonist Luna (Jazmine Quezada, at this performance) has the opportunity to encounter and engage with those in her life who have passed on. Sometimes she danced with them, sometimes she simply watched. But in both cases, there was a distinctly uplifted atmosphere, with equal parts celebration, happiness and nostalgia. Costumed by Lustig and Christopher Dunn in skeleton unitards, these spirits entered and exited the space in a variety of distinct vignettes. Standouts were Frankie Lee Peterson III’s deer solo with its phenomenal double stag leaps along with the subtle yet striking bride and groom pas de deux, handily interpreted by Samantha Bell and Landes Dixon. This duet was imbued with incredibly detailed partnering, but what was most interesting was Lustig’s use of flexion – flexed feet, bent arms and legs. While choreographically intriguing on its own, the flexion also felt right in line with the skeletal frame of the characters. 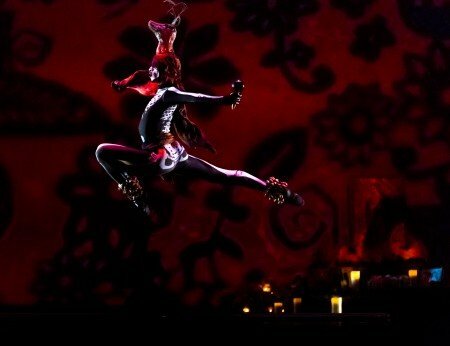 As the ballet reached its conclusion, Quezada lay sleeping in front of the candle and skull-adorned altar that had been upstage center throughout. Had Luna Mexicana been a dream or some other mysterious happening? The lights faded to black and the curtain fell. No definite answer had been provided, instead, a gorgeous ambiguity hung in the air. 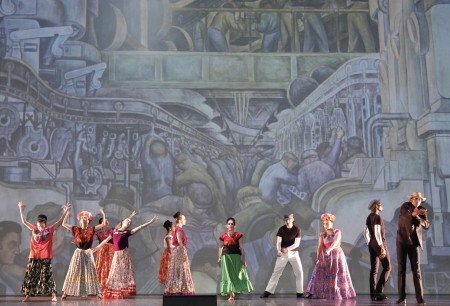 Oakland Ballet and Ballet Folklórico México Danza’s highly anticipated premiere collaboration, Viva La Vida, closed the program with a tribute to an iconic visual artist. 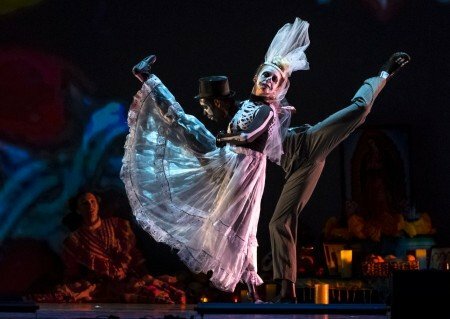 “Inspired by the life and times of Frida Kahlo,” as the program noted, the large ensemble work (dancers from both companies, with choreography/direction by Lustig and additional choreography by Romero) certainly took a deep, and successful, dive into both personal and artistic stories. As a video collage of Kahlo’s paintings cycled on the scrim, different scenes would play out like living tableaux, most underscored by passion, urgency and volatility. For me, the most powerful chapter was subtitled “Portrait of a Marriage.” A 1931 painting of Frida and her husband Diego was projected at the back. Onstage, the image had been recreated – Nina Pearlman as Frida, Alberto Anguiano as Diego – a large metal frame surrounding them. One by one, Bell, Sharon Kung and Constanza Murphy appeared on the scene tempting Anguiano. He stepped out of the frame to dance a series of pas de deux with each of them – a fitting metaphor for stepping outside of marriage and relationship. While Viva La Vida was not too long overall, some of the internal vignettes could use a bit of editing. Dynamically and choreographically, a few were kind of flat, doing the same thing over and over again with no build. I also think a number of the scenes were somewhat obscure, unless you were a Kahlo enthusiast. I very much like her work and know some things about her life, yet, there were several moments that went right over my head. And I bet I wasn’t alone. Having said that, after seeing Viva La Vida, I was motivated to do some research. I wanted to learn more; I wanted to answer questions that had arisen during the performance. My curiosity had been piqued and that’s indeed a measure of good art.